Bloons Player Pack 5 is another part of this interesting puzzle series. 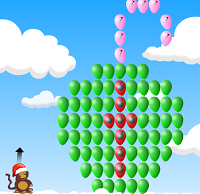 In this game, you control a super monkey. You will throw the darts to destroy the balloons in the map. Each time you break a balloon, you can get power-ups. Balloons will have different effects. Try to destroy as many balloons as you can.